Since 2006, more than 100,000 people have been disappeared or killed in Mexico, a country where more than 90 percent of crimes go unpunished. While running for president in 2012, Enrique Peña Nieto promised a new security strategy for the country, and an end to the highly militarized campaign waged by his predecessor, Felipe Calderón. Since taking office, however, Peña Nieto’s strategy has focused not on the safety of its people but on the confidence of its international investors. To make Mexico more attractive to overseas capital, he has pursued a market-based reform agenda that includes a technocratic overhaul of education, a move to shake up the telecommunications sector and the opening of the energy sector to foreign private investment. New narratives about the “Aztec Tiger” won’t make the kidnappings, beheadings and mass graves disappear, but Peña Nieto is doing everything he can to make foreign investors forget about them. The irony of touting market-based reforms as a means of sweeping the drug trade under the rug is that the cartels themselves have become some of the most ruthlessly effective multinational capitalist enterprises in Mexico. The cartels are beginning to diversify, making money not just from drugs and other criminal activities like kidnapping and human trafficking but increasingly from control over industries like mining, logging and shipping. Meanwhile, finance and real estate sectors in Mexico and the United States are awash with cartel profits, with one United Nations analyst arguing that drug money was the “only liquid investment capital” that kept the international economy from completely imploding in 2008. Over the last few decades Mexican capitalism has become a tangled web of legal and illegal activity, and the distinctions between licit and illicit economies have become increasingly blurred. The policies of the Mexican and US governments are only accelerating this trend. There are two separate but deeply connected histories that have created the situation in Mexico today: first, the neoliberal restructuring of the economy that began in the 1980s; and second, the rise of the drug trade and the cartels that control it. Squarely at the center of both stories has been the Mexican state, whose corruption, incompetence and often contradictory policy choices (in tandem with those of the United States) have served to create vast sums of wealth for a few, while heightening insecurity for Mexico’s working people. When we talk about the drug trade, we are talking about a deeply entrenched part of contemporary capitalism in Mexico, not its undoing. The restructuring of the Mexican economy in the 1980s occurred as the policy of inward-looking, state-led industrial development pursued by Mexico from the 1940s through the 1970s came to a spectacular end with the 1982 debt crisis. A structural adjustment agreement negotiated with the International Monetary Fund required Mexico to devalue the peso, slash government subsidies, cut funding for social programs and privatize hundreds of state-owned enterprises in return for the refinancing of Mexico’s debt. Then, Carlos Salinas de Gortari, who came to power in a 1988 election widely regarded as fraudulent, moved Mexico from a policy of temporary austerity to one of permanent state restructuring. He amended the constitution to allow for the private sale of communal lands known as ejidos, deregulated the telecom sector, denationalized the banks and, most importantly, reoriented Mexican industry toward the export sector, negotiating of the North American Free Trade Agreement (NAFTA) with the United States and Canada. Salinas promised that NAFTA would lift Mexicans out of poverty by creating new manufacturing jobs and famously argued that the agreement would create a Mexico that exported goods rather than people. Mexico would become part of the first world, Salinas proclaimed, and to prove it, he oversaw the country’s entry into the OECD, the club for the world’s leading industrial nations. Twenty years after the implementation of NAFTA, however, it’s now clear that most of Salinas’s promises have gone unfulfilled. Mexican economic growth during the period was among the lowest in Latin America, and poverty and inequality levels remain at pre-NAFTA levels. A study from the Center for Economic and Policy Research points out that while the poverty rate remained stagnant over the last two decades (at around 52 percent), population growth has actually meant that 14.3 million more Mexicans were living in poverty in 2012 than in 1994. Unemployment also increased in Mexico during the period, and some 4.9 million jobs were lost in the family farm sector due to post-NAFTA declines in commodity prices and reductions in state protections. And while the exports of goods from Mexico did increase, as Salinas had promised, NAFTA didn’t stem the flow of people across the border. Instead, the flow of undocumented workers across the border increased: according to a Pew Research report, the number of Mexicans that immigrated to the United States rose from 430,000 in 1994 to 770,000 in 2000, before tailing off because of increased border enforcement measures and the recent economic recession. (One additional result of NAFTA is an increased exposure of the Mexican economy to downturns in its northern neighbor.) This spike in migration resulted in the growth of the Mexican population in the United States from 4.5 million in 1990 to just under 12 million today. Of course, while NAFTA forced people to migrate, concurrent policies of border militarization made that migration increasingly difficult and dangerous. Instead of integrating the North American labor market or adjusting the number of work visas to match demand, the United States militarized its border with Mexico to previously unimaginable levels. Since 1994 the number of Border Patrol officers has increased from just over 4,200 to more than 21,000; the number of hours agents spent patrolling the border has gone from 3 million to more than 20 million; and the Border Patrol’s annual budget has increased from $400 million to more than $3.4 billion. At the same time, sectors that were privatized during structural adjustment but protected from competition under NAFTA—telephone, television and transportation among them—are now monopolized by some of Mexico’s richest men. Mexico’s new billionaires include the owners of the two largest television networks; the distributors of Coca-Cola; and Carlos Slim, who controls more than three-quarters of all telephone service. (Recent reforms may begin to break up these monopolies, but many believe they will actually benefit Televisa, the media giant with close ties to the ruling party, the Institutional Revolutionary Party, known as the PRI). The top 10 percent in Mexico now control more than 40 percent of its national wealth. The policies of the last twenty years may have made a small group of Mexicans part of the global ultra-rich elite, but they left the vast majority and the country as a whole no better, and in some cases much worse, than before. It was in this same period that the drug trade intensified and cartel power expanded. As the historian Froylán Enciso has shown, this was anything but inevitable. Instead, the cartels’ rise can be attributed to a combination of domestic and international factors, including US policy and involvement in Mexico, Mexican government policy, widespread corruption and impunity, and the $100 billion-a-year market created by demand for drugs north of the border. These factors together have fostered conditions under which the drug trade has boomed, creating a spectacularly violent twin for Mexico’s export-oriented “legitimate” economy. The crisis that brought on neoliberal restructuring also brought on political destabilization, as the PRI, which had ruled Mexico since the late 1920s, began to lose its grip on power. Starting in the 1990s the opposition parties, the Democratic Revolutionary Party (PRD) on the left and the National Action Party (PAN) on the right, began to win governorships and seats in the legislature. This, in turn, destabilized the drug business. At the height of PRI rule during the 1970s, a system for controlling the drug trade had been instituted, whereby a PRI boss maintained political control over a local precinct known as a plaza, and distributed the rights for a particular narco boss to move drugs through the plaza via a kind of franchise license. In return, the state officials were rewarded not only with votes but also with payments from the drug profits. But that peace would begin to unravel as PRI power did. The arrest of the Guadalajara cartel’s Miguel Ángel Félix Gallardo, known as “El Padrino,” or the Godfather, set off a series of power struggles among subordinates and rivals, like that between Sinaloa’s Joaquin “El Chapo” Guzmán and Tijuana’s Arellano Félix brothers. In the 1990s, the cocaine trade in Mexico grew rapidly, largely the result of a multibillion-dollar US military program to eradicate the trade in Colombia and cut off Caribbean supply routes. Mexican traffickers evolved from subcontracting transport services for the Colombian cartels to become wholesalers in their own right, and the profits involved began to skyrocket. Traffickers became more powerful than the PRI party bosses who were supposed to regulate them, and competition between groups turned increasingly violent. Then, in 2000, the PRI’s seventy-one-year rule over the Mexican state came to an end with the election of Vicente Fox, a former Coca-Cola executive from the conservative PAN. The following year, Chapo Guzmán, who had been arrested in Guatemala in 1993, escaped from a maximum-security prison in Guadalajara when threatened with extradition to the United States. According to Mexican journalist Anabel Hernández, he did so with the full knowledge and support of Fox’s government, perhaps hoping to restore the “pax mafiosa” under Sinaloa leadership. Guzmán had continued to oversee the Sinaloa cartel’s operations while imprisoned, but after his release he worked to consolidate his power and enlarge the territory under his control. As a result, battles between cartels vying for turf and power intensified, with groups like the Zetas, who had previously been an armed wing of the Gulf cartel, emerging as powerful cartels in their own right. 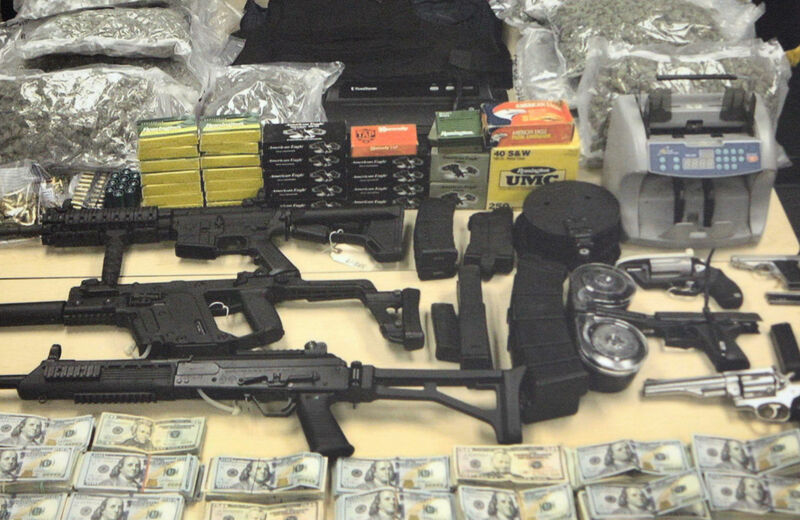 Organized crime, as Peter Watt has argued, became increasingly disorganized. This violence only increased after Fox’s successor, PAN’s Felipe Calderón, declared war on the cartels shortly after taking office in 2006. The massive militarization campaign begun by Calderón has now taken some 100,000 lives. In each year of his presidency, more people were forcibly disappeared than during the entire duration of Pinochet’s infamous military dictatorship in Chile. Washington supported this militarization with a massive influx of military aid and assistance under the 2008 Mérida initiative, which supplied $1.4 billion over three years. In fact, US policy—specifically the militarization of the border since NAFTA—has strengthened cartels’ power and enabled them to diversify their operations. In addition to profiting off of the drug trade, cartels have branched out into the business of kidnapping, human trafficking and extortion. Rather than stopping migration, the militarization of the border has made migrating more costly and dangerous than ever. An outdated migration policy that allots an equal number of visas to each country—be it Mexico or Andorra—only exacerbates the problem. Today, migrants have little choice but to pay cartel-controlled coyotes thousands of dollars to guide them across rugged terrain in desolate areas. In fiscal year 2012, officials recovered the remains of 477 migrants—a 27 percent increase from the previous year and the second-highest total ever. Thousands more migrants are kidnapped each year. Some survive by paying an exorbitant ransom, working for the cartels or acting as drug mules. Those that cannot pay or refuse to enlist are often executed, innocent victims of ruthless cartels that have learned how to exploit US and Mexican policies and each country’s indifference toward migrants’ lives. In some places where the state has been eviscerated, the cartels have emerged as a kind of parastate, delivering much-needed services and the promise of economic opportunity. Some expressed shock and disbelief when hundreds of people took to the streets in Sinaloa after the arrest of Chapo Guzmán in February. But it makes sense: El Chapo had infused millions of dollars into the economy of a poverty-stricken state and created jobs—in security, transport and manufacturing of drugs—that otherwise would have been nonexistent. Indeed, in 2008, the drug trade was Mexico’s fifth-largest employer. It’s likely the marchers were thinking about what El Chapo’s capture will mean for them and their ability to put food on the table, rather than its impact on the drug war. And of course, those marching in Sinaloa weren’t alone in their support of the cartel. The Mexican newspaper El Universal recently uncovered evidence that both the Mexican government and US Drug Enforcement Agency adopted a policy of supporting key parts of the Sinaloa organization in hopes of rooting out rival cartels—from the Tijuana, Juárez and Beltrán Leyva cartels in the north, to the Familia Michoacana and Knights Templar in central-western Mexico, to the Zetas in the east and along most of the Gulf Coast. The backing of both states helped the Sinaloa cartel defeat rival groups and reinforce its already dominant position relative to other cartels. Moreover, Peña Nieto’s decision to extend Calderón’s “kingpin” strategy is useless: the capture of El Chapo will not dismantle the Sinaloa cartel or solve the root problems that have allowed cartels to flourish, just as the arrest of Jamie Dimon would not take down JP Morgan nor lead to real changes to the banking industry. It’s not to say that cartel leaders shouldn’t be held accountable or brought to justice; it’s that the problems underlying the multinational businesses they oversee are much larger than any one individual. In his new book Campo de guerra, Mexican writer Sergio González Rodríguez notes that rampant corruption, a “false state of law,” and a “culture of a-legality” allow the legal and illegal to co-exist in Mexico. The restructuring of the country’s licit economy and the simultaneous and often symbiotic growth of its illicit economy have led to unprecedented levels of economic and political inequality and insecurity. Indeed, even the violence of the drug war itself has been used as a pretense for processes of “urban renewal” in cities like Ciudad Juárez, displacing poor and working people and benefitting multinational real estate-interests. With the recent settlements against international banks like HSBC and Wachovia, which protected the banks from criminal prosecutions after they were caught laundering billions of dollars for the cartels, the US government has signaled that the smooth functioning of the global financial system takes precedence over rooting out the cartels. Peña Nieto’s reform strategy shares these priorities. At the same time as the state and legitimate economies come to rely on illicit funds, the cartels have diversified into new markets—not just extortion and kidnapping, but into formerly legitimate sectors as well, operating in a grey area between legality and illegality. The Zetas, for example, use their dominance in the regions that produce oil and natural gas to allegedly steal and sell it to companies such as Royal Dutch Shell. In addition, the Knights Templar have made serious inroads into the mining industry, using violence, extortion and robbery, as well as simply opening new unregulated mines themselves. The cartels’ move into extractive industries has been made not just to launder money but also to seek new profit streams. Tracing shell companies set up with cartel funds to take advantage of deregulation in the petroleum sector, for example, is difficult, and the demand for heavy metals and energy sources from countries like China mirrors the demand for illegal drugs in the States. With the promise of profits to be made, the cartels are coming more and more to resemble diversified multinational corporations. This reality, however, while shaped by the structural forces of international capitalism, is also the result of policy decisions made by the Mexican and US governments. If Mexico is going to be “saved,” as a recent Time magazine cover put it, it will not be through doubling down on the market-driven policies that have structured the country’s dual economies over the last few decades but through sustained pressure, from below and across borders, to bring to light the contradictions of capitalism and to fight for economic and social justice. Here in Mexico, that fight has put thousands in the streets of the capital in recent months, and as John Ackerman recently reported, resistance to Peña Nieto’s reforms is growing. That the rise of the cartels and the deregulation of the Mexican economy occurred together is not a coincidence: both have used state structures to drive a relentless upward redistribution of wealth, while visiting immense physical and economic violence on the majority of Mexicans. Reversing this trend will require recognizing the extent to which Mexico’s “good” and “bad” capital are increasingly inextricable. Elite politicians, businessmen, and cartel leaders aren’t strange bedfellows in Mexico—they share the billions under the mattress. Christy ThorntonChristy Thornton is the former Executive Director of NACLA, and is a graduate student in the Department of History at NYU. Follow her on Twitter at @llchristyll. Adam GoodmanAdam Goodman, a doctoral student in history at the University of Pennsylvania, is a 2014–15 Miller Center National Fellow. He lives in Mexico City. Follow him on Twitter at @adamsigoodman.